As we wave goodbye to the festivities of Christmas and New Year and wade through the gloom of February, those of you planning a wedding in 2018 will have started to turn your attention back to the organisation of the Big Day. With a list including venues, accommodation, guest list, seating plans, cake, flowers, wedding breakfast, favours, evening buffet, dresses and suits, anything that can be quickly organised and ticked off feels like a worthy achievement. 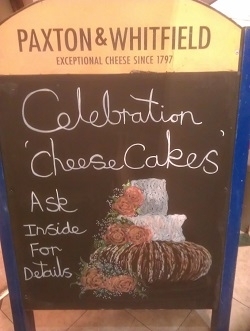 With this in mind, Cheese Wedding Cakes should be viewed with interest and excitement – they can tick two boxes off in one go! By choosing a savoury cake, which can look every bit as decorative as their sweet alternative, you can provide the traditional ‘cutting of the cake’ moment and the bulk of the evening buffet. Of course, you can always have a cheese cake in addition to the traditional sweet one. The process of choosing your cake can be as involved or as simple as you want it to be. Browse our website for a stunning array of cakes, carefully designed to provide delicious, balanced cheese boards for numbers ranging from 20 to 220 guests. Alternatively, arrange an appointment with one of our shops and receive one to one guidance on designing your own cheesecake to suit your own specific favourites, themes and numbers. 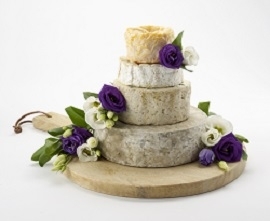 Cheeses come exclusive of decoration which gives you the opportunity to use the same flowers from the tables and bouquet - just make sure they are not poisonous! Add in some accompanying fruit and the cake will look spectacular.